In 1837, the young tenor Gilbert-Louis Duprez burst onto the stage of the Paris Opéra as Arnold in Guillaume Tell. To the alarm of many, he sang a high C with the full weight of his chest voice (ut de poitrine) in the Act IV cabaletta ‘Amis, amis’ (6 minutes into the extract below). Adolphe Nourrit had created the role in 1829, singing the upper register in the conventional way, with a much lighter head voice, or voix mixte. Critics contrasted Nourrit’s gentle, aristocratic manner and his clear, pure, ‘French’ sound with the more realistic, earthy ‘Italian’ performance of Duprez (he had trained for nine years in Italy) – though not everyone was convinced on first hearing. Rossini famously declared that the tenore di forza sounded like a chicken with its throat cut, and Berlioz pointed to Duprez’s shaky intonation above A flat, and to the fact that some numbers had been transposed for him. Twenty years later Berlioz was still fearing for tenors ‘trying to squeeze a high chest B or C from their ravaged throats’, and mocking the earnestness of ‘amateur poitrinaires’ for whom all interest in revivals of Tell was focussed on the ‘diamond top C’. Nevertheless, Duprez has been viewed as the first ‘modern’ tenor: he was in large part responsible for the continuation of Tell in the repertory, and his fuller sound was emulated by other singers and eventually demanded by composers. The lighter head voice is rarely heard in performances today – though it is occasionally used for comic effect, notably by the cross-dressing nuns in Rossini’s Le Comte Ory (1828). These different styles of singing had implications for the ways in which revolutionary heroes were viewed in the 19th century. Critics had another opportunity to compare Duprez with Nourrit in 1837, when Duprez sang the role of the Italian revolutionary Masaniello in a revival of Auber’s La Muette de Portici (1828). Nourrit had famously toured Parisian theatres singing the Marseillaise in the wake of the 1830 Revolution and had so cemented his credentials for singing such roles – but his perceived aristocratic bearing, and delicate, fluty tone, helped to distance him from the reality of the drama’s politics, arguably making the dangerously radical Masaniello more palatable to the Opéra’s middle- and upper-class audiences. In contrast, critics were alarmed by Duprez’s earthy realism: his swarthy Italian looks and his fuller voice brought the opera’s uprising to life in ways that made many uneasy in such precarious political times. The extraordinary stamina required for these French roles, particularly when sung with the full chest voice, has been described by the tenor Bryan Hymel. In contrast to Italian opera of the period, which makes virtuosic show of its occasional high notes, French opera has a higher overall tessitura – and Tell reportedly contains at least 19 high Cs. Donizetti’s La Fille du régiment (1840), written for the Paris Opéra-Comique, dramatizes this difference in the famous aria ‘Ah, mes amis, quel jour de fête!’ with its nine high Cs. Although Tell is famous as a vehicle for the new kind of tenor of the 1830s, it is striking how much the chorus dominates both the music and the drama. Grand operas generally depicted conflict between peoples, prompting one wag to declare that the Opéra could throw its armies into the balance of power in Europe. In Tell the chorus was subdivided into various groups of Swiss shepherds and peasants, and Austrian huntsmen and soldiers. The Opéra had a chorus of sixty to seventy singers at this time (about two thirds of whom were male), trained at the Conservatoire to sing increasingly difficult parts, as well as to move convincingly around the stage, qualities unmatched at any other opera house in Europe. Then the whole chorus, the soloists, the orchestra, and the percussion instruments, which have not been heard since the beginning of the act, one and all take up the cry: ‘To arms!’ And at this last and most terrible war cry, which bursts forth from all these breasts, shivering in the dawn of the first day of liberty, the entire instrumental mass hurls itself like an avalanche into an impetuous Allegro! Ah, it is sublime! A final post before rehearsals start next month will examine the political messages encoded within Tell, and some of the ways it was adapted for performances beyond Paris – notably in 19th-century London. Sarah Hibberd is Associate Professor in the Department of Music at the University of Nottingham. Find out more about her association with The Royal Opera as Writer in Residence. A recent Royal Opera production of La Fille du régiment is available on DVD. Again, many thanks Sarah for another splendid and most informative article. Would you agree that when he composed the brilliant cabaletta for Di quella pira in Il Trovatore ,Verdi was influenced by Arnold's equally brilliant " Amis..Amis " ? I am sure we are looking forward to hearing John Osborn and our wonderful ROH chorus in July. I'm sure you are right - Manrico is a similarly energetic, rebellious character, and Verdi was surely familiar with 'Amis, amis'. Indeed we find all sorts of inspirations from French dramaturgy and musical style in Verdi's operas - not only in his Parisian operas/adaptations, but in his Italian works too. Although _Guglielmo Tell_ had limited exposure in Italy in the first half of the century, Verdi would surely have seen it when he was in Paris (in 1847-9, for example). One of the most interesting thing about French grand opera is the way it invites us to contemplate international currents and exchanges. Wagner too - despite his posturing in his later writings! - was profoundly influenced by Parisian opera and practices. Whilst Verdi may have been influenced by Tell regarding Manrico's cabaletta, let's not forget that as written in the score it is a much tamer affair than the Franco Corelli version we are now used to. The original score does not contain the famous two top Cs ("o te´co al meno" in the first verse and "all'armi" at the end). The tenor only has to sing a solid G (see Licitra's Scala version by that Verdi purist, Riccardo Muti). It was Enrico Tamberlick, the possessor of a rotund top C who inserted the note and created the tradition of the Pira Top C some 10-15 years after the 1853 premiere and almost 30 years after Duprez's "discovery". Many thanks Sarah and If I may say so, you are absolutely right about the way French Grand Opera invites consideration of international currents and exchanges. 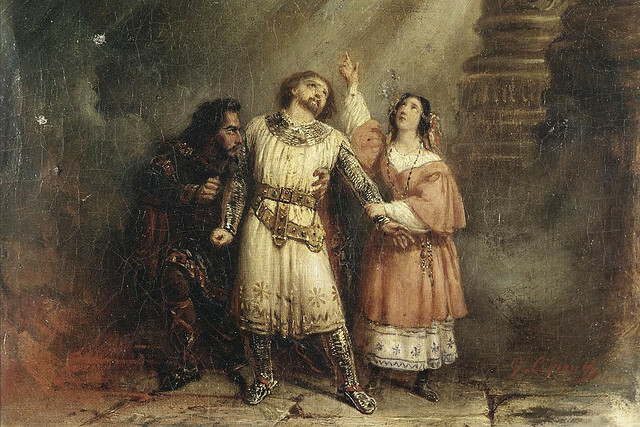 Returning to Verdi, he would most certainly have been influenced by the power of Rossini's music for the chorus in Tell to compose similar powerful choruses in say Attila of La Battaglia di Legnano which would have been immensely popular with the Risorgimento. As I said earlier,I very much look forward to your piece on the poltical messages in Tell. Victor, I also much enjoyed your comments in respect of the original score of Il Trovatore .Without mentioning the tenor concerned, my wife and I heard him sing Manrico during a performance of a new production where the original score was observed .Although that performance was much enjoyed, we saw the same tenor about seven years later in a revival of that production when he was permitted to give us a least one top C and I know which performance we preferred! There are several recordings where one can hear Pavarotti sing both "Amis..Amis " and "Di quella pira".The comparison is fantastic.